There is a need to contain the centrifuge in the isolator to ensure the safety of the operator when dealing with high active substance including bulk pharmaceutical. 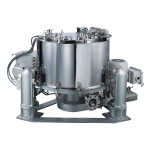 This unit is composed of the centrifuge designed for high active substance separation and the isolator corresponding to OEL level from 0.1 to 100μg/m3. 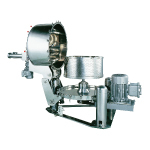 The centrifuge can be operated ensuring the safety of the operator in the containment of state. 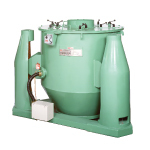 This is a basic model of the most widely used top-discharge vertical centrifuges. For the construction materials, stainless steel, Teflon lining, rubber lining, etc., are available according to the use and conditions. Variable and constant capacity type hydraulic pumps. A best seller with more than 2,000 units sold. Ideal for large-volume processing. Used in all industries from pharmaceuticals and food to industrial waste. 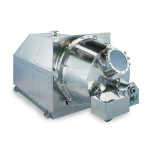 This model is the representative bottom-discharge centrifuge where a filter cloth, electron beam, or wire net is attached to the inside of the perforated basket. Solid is centrifuged from fluid and the cake is discharged from the bottom of the basket by the scraper device. Inverter control allows any revolution speed. Manual operation type and fully-automatic operation type are available. 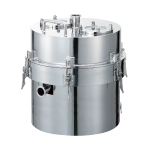 Bottom-discharge centrifuge used in various fields thanks to its high basic performance. A new original filter cloth attachment mechanism has been developed. 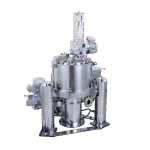 The mechanism enables filtration from both the top and bottom of the basket, which achieves a quantum leap in filtering efficiency of low-filterable substances such as Chinese herbal medicine, starch, etc..
Condensed the know-how Matsumoto hace accumulated in horizontal centrifuges in newly developing units that respond to needs of the pharmaceutical, food, and fine chemical manufacturing processes. 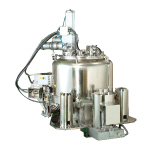 Enables fully-automatic recovery of the entire crystal without crushing it. 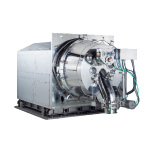 Pressurization is available, which is not supported by conventional centrifuges. The moisture content of crystals can be maximally reduced by applying pressure. Moreover drying efficiency can be increased significantly by directing hot air-flow into them. Answers needs for higher cost performance and the omission of automatic functions while maintaining the excellent centrifugation capabilities of the JMP Series fully-automatic horizontal centrifuge. Of course, this model is GMP-compliant. 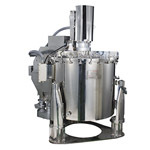 Reliable automatic cleaning of the internal wetted part delivers outstanding performance for pharmaceutical products as well as electronic materials which require high purity. 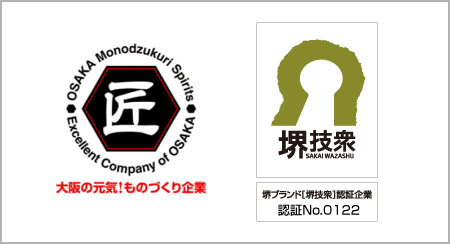 Small-quantity samples in the early stages of development can be tested under various conditions. Contributes to shortening of the development time. The substance being processed can be conveyed to the following process (dryer, etc.) in a sealed state. Separation of hazardous substances can be handled completely automatically. 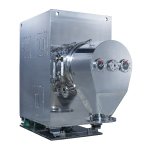 This is a motor direct-connection type skimming centrifuge which separates low-filterable particles from the original fluid and recovers the clarified fluid or the particles. It is a very important issue for the users of expensive cutting oil torecover or reuse the oil and prevent the environmental pollution itcan cause. We have an effective solution for that purpose. 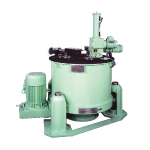 Designedand built by MATSUMOTO, the pioneer of deoiling machines, theM-series Continuous Chip Deoiling Centrifuges answer all the needs of cutting oil users because they have many advantagesover conventional equivalents. EfCI's products is a complete build-to-order manufacturing along the customer's specifications. 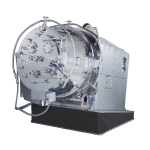 We carefully select options required to comply with GMP and launch the new centrifuge series "PG series" that includes all the selected options to enhance the quality.